Capital controls have hit the Greek economy at just the wrong time. A week-long closure of Greek banks, announced on June 28, would have been bad for Athens at any time of year. But the restrictions are coming in just as the country’s core export sector – tourism – begins its peak season. The holiday industry is one of the pillars of the Greek economy. In 2014, the sector generated 29 billion euros – 17 percent of GDP – the World Travel and Tourism Council (WTTC) says. Around 700,000 Greek jobs, a fifth of total employment, depend on the sector. Tourism grew strongly in 2014 and the early months of this year. But unfortunately almost two-thirds of annual tourism revenue is generated in the third quarter, figures from the Greek central bank show. This activity is highly vulnerable to political and financial unrest. In the first stage of the 2009-10 Greek crisis, violent demonstrations meant leisure tourism revenue dropped 10 percent for two years in a row. Relative to the pre-crisis peak in 2006, about 15 percent of all jobs in tourism were lost. The Greek government stresses that foreign visitors can withdraw unlimited cash – unlike domestic residents who are limited to 60 euros a day. But they still need to find an ATM that contains money. And a number of European governments have already amended their travel advice for citizens, recommending that extra cash be taken. German news website “Spiegel Online” reported that Greece’s holiday operators have received mass cancellations since Sunday. Shares in German tour operator TUI, which has also been hit by last week’s violent attack on a Tunisian hotel, dropped almost 7 percent on June 29. Having been predicted to grow 2.5 percent during 2015, the most recent forecasts for the Greek economy are now for minimal growth: Greece was in recession during the first quarter of 2015. The ill-fated timing of capital controls will make matters much worse. If Greek citizens vote against euro zone bailout measures in a referendum on July 5, an event which could mean the country leaving the euro zone, transactional inconvenience could give way to social unrest. Greece would be left with fewer tourists – and even less money. 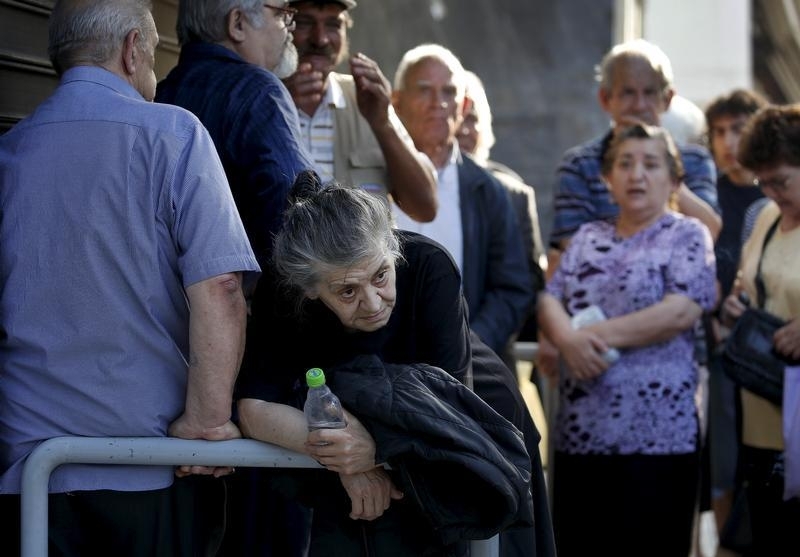 Pensioners line-up outside a branch of the National Bank of Greece hoping to get their pensions, in Athens, Greece June 29, 2015. The Greek government has stressed that capital control do not affect foreign tourists, who can still withdraw cash using their credit or debit cards. The outlook for the Greek economy has deteriorated sharply in recent months. In April, the International Monetary Fund forecast 2.5 percent of real GDP growth in 2015 and 3.7 percent in 2016, while in early June the Organisation for Economic Cooperation and Development foresaw 0.1 percent in 2015 and 2.3 percent in 2016. Negative quarterly GDP growth between October and December as well as between January and March mean that the economy fell back into a technical recession at the end of the first quarter. According to unnamed sources cited by the German news magazine “Der Spiegel”, the Greek tourism industry has been hit by a “wave of cancellations” since Sunday. Shares in German tour operator TUI on June 29 lost 6.9 percent to 14.65 euros, while Thomas Cook Group’s stock lost 2.8 percent to 139.0 pence.